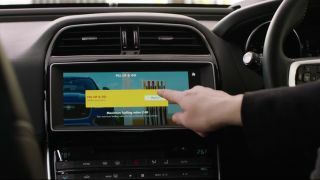 Jaguar has announced a new way to pay at the pump, teaming up with Shell to create an app that allows drivers to purchase fuel in-car. Available for the Jaguar F-Pace, F-Type, XF and XE models in addition to the latest ranges from Land Rover, the newly announced Shell app uses Apple Pay or PayPal to make purchases all within the car's dashboard at participating Shell service stations. As well as speeding up transactions, the Shell app also logs journey information and receipts digitally, reducing waste and simplifying company reimbursements during corporate car trips. Jaguar also points out that parents can enjoy the cashless system, as it ensures they won't have to leave children in the car unattended to go pay inside the station. Jaguar claims this is the first use of an in-car payment system for fuel, and that it's only the beginning of its potential. The automaker teases "future cashless tech research" to come, to include faster ways to pay inside your vehicle for things like parking or drive-through fast food - all things we'd personally love to see go the way of mobile payments after one too many lost parking vouchers and fumbled milkshakes in the car. Drivers in the UK can access the app starting today, with Jaguar intending to add global support - as well as Android Pay - over the course of 2017.